You may never have seen sheep without a shepherd, but have any of you ever seen a child without a parent? A lost child is a very sad thing. Have any of you ever gotten lost? (Let children respond.) It can be very frightening to lose sight of your parents when you’re in a strange place and you don’t know where to go. You can feel scared and confused and not know which way to turn or where to start looking for your mom or dad. The best thing to do in that situation, of course, is to stay put and wait for your parents to come back and find you. Kids usually pay attention and stay close to their parents, or they yell for their parents if they get lost for a few moments. But do you know what sheep tend to do when they are without a shepherd to lead them? Sheep are not very smart. 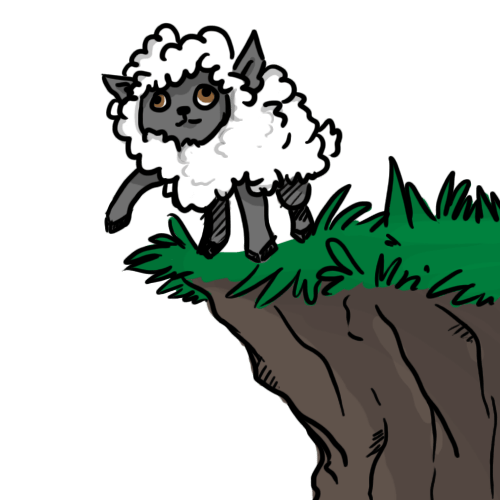 They easily panic and run in circles; and if no one is guiding them or leading them down a safe path, they have been known to run straight off the edge of a cliff. Sometimes there is trouble when a shepherd rounds up his sheep at night to get them into pens. The sheep don’t understand that the pens are there to keep out danger, to keep wolves from jumping in and eating them. They get scared of the walls, and they run away from the place where they would be safe. And when a sheep runs away from its shepherd, do you know what you have? You have a sheep “on the lam.” The expression “on the lam” means running away or escaping from something. A prisoner “on the lam” is one who’s escaped from jail. A sheep on the lam is in big trouble. The sheep has no sense of direction, and it can’t find its way home. It can’t stop and ask for directions. It could run straight into trouble. The sheep may be free from the walls and the pen, but without the protection and guidance of the shepherd, it is in danger. Jesus said that people are like sheep because sometimes people are just as foolish as sheep. We run away from God, or we turn away from rules that God gives us to keep us safe and protect us from evil. And when we run away from God and his loving care, we are like sheep without a shepherd. And that is a baaaaad thing to be. Even though sometimes we don’t like rules, remember that God’s rules are like walls that protect us and keep us safe. Prayer: Dear Jesus, thank you for being our Good Shepherd and giving us rules and boundaries to keep us safe. Help us listen to your voice and follow the good path that you lead us on.